When it was first published in 2009, The Tangled Bank was the first textbook every written specifically for non-majors college students and became widely adopted in colleges across the United States and other countries. For the second edition, Zimmer has thoroughly updated the book, incorporating cutting-edge research from across biology and developing more effective ways to explain the key concepts of evolution. With vivid portrait of scientists and their research, he demonstrates how vital evolution is to all branches of modern biology—from the fight against deadly antibiotic-resistant bacteria to the analysis of the human genome. Richly illustrated with over 300 illustrations and photographs, The Tangled Bank is essential reading for anyone who wants to understand the history of life on Earth. For a study guide, lecture slides, and free exam copies, visit the publisher’s web site. Under certain conditions, two lineages will evolve into very similar-looking forms. 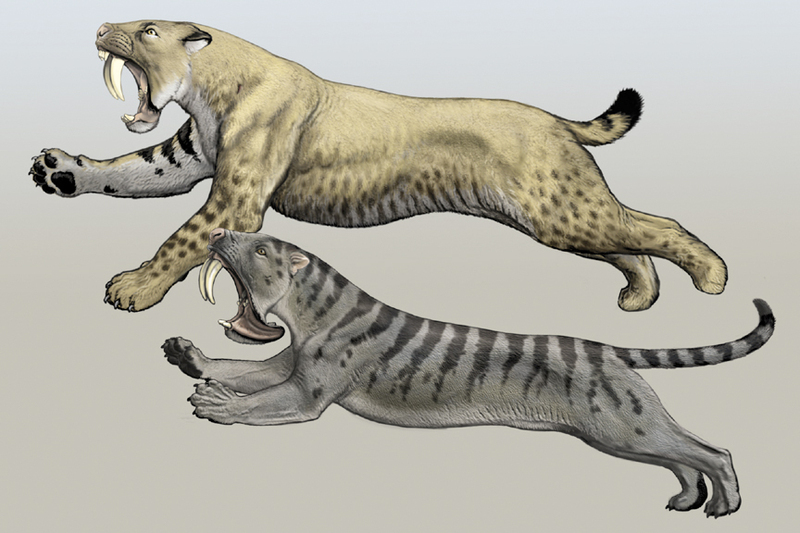 The top animal is a saber-toothed cat, related to lions and tigers. The bottom one is a marsupial, more closely related to kangaroos and opossums. Art by Carl Buell. This is the first textbook I have seen by a professional science writer. If this is a sort of experiment in textbook publishing, it is a spectacularly successful one…The result is an introduction to the field that is not only accurate and up to date, but—of course—well written. How important is the prose in a textbook? For students, lively versus leaden, or clear versus cryptic, can be the difference between understanding and not, between being turned on to a field and being turned off. For what it is worth, I solicited help for this review from a biologically inclined high school student, who read a few chapters and reported it to be both clear and engaging….In summary, this is an excellent textbook, one that ought to be—and will be, I predict—widely adopted. “The Tangled Bank is an attractive and captivating book, masterfully told…All readers will be able to immerse themselves in the captivating field of evolutionary biology as written by a master storyteller.” Read the full review. “Those familiar with the books, newspaper and journal columns, and commentaries by Zimmer will be delighted that he has turned his considerable writing skills to creating an accessible and superbly illustrated introduction to biological evolution. 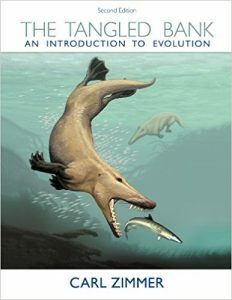 The best books on evolution are those that synthesize the processes of evolution (natural selection, mutation, the origin of variation, the role of development) with the patterns of evolution (the fossil record, phylogenetic trees, changes within and between species) and introduce readers to the major players and how they study evolution. Zimmer describes all these processes and patterns of evolution admirably, using his flair with language and substantial knowledge of biology–the latter aided by four scientific advisers, who have advised him well. Zimmer has a gift for finding just the right example to fascinate the reader, encouraging him or her to want to read on and learn more. The book is astoundingly well illustrated; it could serve as a coffee-table book as well as an up-to-date introduction to the changing ways in which evolution has been and is being studied. The inclusion of selected readings allows entry into the primary literature. A book to both browse and read in depth. Summing Up: Highly recommended. All libraries.” Read the full review. “The back cover of The Tangled Bank is plastered with enthusiastic encomiums by several dominant figures in evolutionary biology and science education today. Among other features, they point out the quality and compelling nature of its writing and illustrations, and its ability to capture the ferment of this rapidly moving scientific field for a nonmajors audience. As instructors with many years of experience teaching evolution topics to undergraduates, we agree. Carl Zimmer’s approach is a rather radical departure from most textbooks. But we fully expect it to rivet reluctant students’ attention, and that is exciting indeed.” Read the full review. “For students of evolution or scholars who want to know the specifics about particular evolutionary processes, this is an excellent read. The fact that it is understandable to beginners and fascinating to scientists makes this book truly unique and valuable.” Read the full review. “The book is billed as the first textbook on evolution for the general reader, and in that framework, it excels.” Read the full review. “This book is, hands down, the best textbook I’ve ever read.” Read the full review. “In the best of all worlds, every educated American could and should read this book, and as a result, would have a much richer understanding of evolution as a force directly affecting our lives.” Read the full review. “The best textbook I’ve seen for a nonmajors introductory biology course about evolution.” Read the full review.